It’s called the Transit Zone: a 6,000,000+ square mile area with two primary paths. 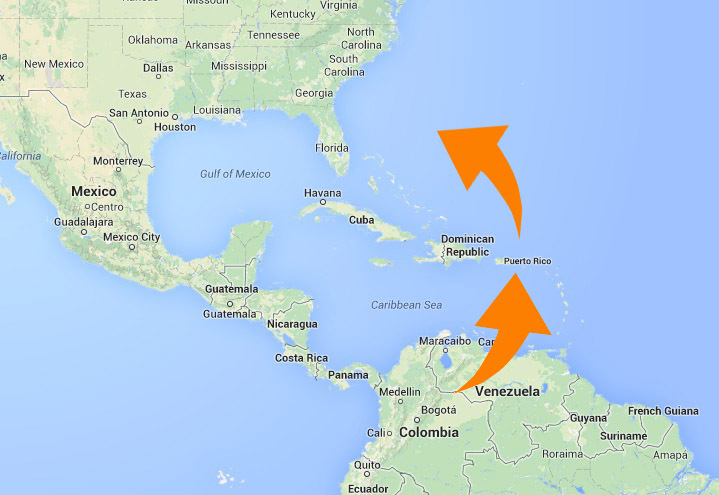 One goes through Mexico and the southwestern U.S., and the other goes through the Caribbean, including Puerto Rico. As the U.S. war on drugs becomes more successful at the southern border, the Caribbean path becomes more appealing to drug cartels. One of the consequences of this change has been startlingly high levels of drug-related violence in Puerto Rico. The U.S. Coast Guard is in the forefront of efforts to disrupt the flow of drugs through the Carribean to the United States, and in the forefront of efforts to reduce drug-related violence in Puerto Rico. However, a new report from Government Accountability Office reveals that the Coast Guard has not been meeting its goals for protection in this area. What were the trends in the Coast Guard’s deployments of resources to the transit zone for drug interdiction operations during fiscal years 2009 through 2013 and to what extent did the Coast Guard meet its deployment and mission performance targets during this time period? What actions has the Coast Guard taken to combat illicit drug smuggling into Puerto Rico and the U.S. Virgin Islands during fiscal years 2009 through 2013 and what have been the trends in vessel and aircraft deployments during this time period? In other words, what has the Coast Guard been doing to protect U.S. territories – and, relatedly, the rest of the country – and thus lessen the impact of the drug trade? The report repeats what is now common knowledge: Puerto Rico is an appealing portal for drug smugglers because travelers from Puerto Rico to the mainland do not have to go through Customs on arrival. The Coast Guard patrols the area with ships and helicopters, stopping vessels suspected of smuggling drugs, in efforts to make it more difficult to use Puerto Rico as a way station for drug traffic from South America to the U.S. The Coast Guard also supplies other vessels, such as Navy ships, with specially-trained personnel to disrupt the drug trade when opportunities arise during their normal operations. In 2009-2012, the Coast Guard met about 80% of its deployment goals for Puerto Rico. In 2013, with sequestration, their activity was severely limited. The report suggests that increasing difficulty in keeping legacy (i.e., outdated) vessels in operation is the main reason for the failure to meet the goals. This doesn’t explain why the Coast Guard got less than halfway to meeting its goal for specialized personnel on other vessels, but budget restrictions particularly during the 2013 sequestration is offered as the explanation for this aspect of the failure. The report also points out the increasing number of disasters, including earthquakes and oil spills, to which the Coast Guard must respond. Nonetheless, the Coast Guard has nearly tripled its efforts in and around Puerto Rico recently, largely as a part of Operation Unified Resolve. Rep. Pierluisi suggests that pressure from himself and other legislators has been instrumental in increasing the Coast Guard’s Commitment to Puerto Rico in recent years.